Type in ‘zombie’ or ‘undead’ into the Amazon Kindle search engine, for a moment, and take a look at the results that appear. As I write this review, there are almost 25,000 different titles that involve that keyword in some manner. It’s obviously an incredibly popular genre to be writing in at the moment, with dozens of new titles being listed every single day. But when you take a look at all of the titles that pop up in the first page – or ten – there’s a distinct uniformity of plot (and cover image) that rapidly becomes apparent. Open up the product pages for a dozen of these titles, and you’ll see the same plot and characters appearing, with some very minor variations on a theme: it’s set in the modern day, the undead have suddenly and inexplicably risen from their graves, or from the streets after dying from some kind of plague/disease/bioweapon, and the plucky protagonist is fleeing for their life from the shambling/walking/running revenant masses. The plot usually takes place in a major city, or perhaps a large town. If it’s the first title in an on-going series, then perhaps the third or fourth book might transplant the action to a rural setting, or the hinterlands between cities. Maybe the setting will be some kind of isolated military complex or prison facility for a little bit of variety, but that’s all. If you’re very lucky, that title will actually be well-written and competently plotted, with characters that actually seem real and which you come to care about (Frank Tayell’s Surviving the Evacuation series is an excellent example of this, and one which I will begin reviewing in the near future). However, it won’t stray far from the boundaries that I’ve listed above; and as such, I get genuinely enthusiastic when I see an undead thriller where the author has used a little bit of imagination and made a major change to the setting and narrative conventions of the genre. K Bartholomew’s fantastic duo of titles, Not Dead Yet (Books I and II), which I reviewed in an earlier blog post, should be seen as an important pioneer in this regard: eschewing the modern-day setting, the author instead sets the zombie uprising in mid-Victorian Britain, the undead swarming through Ireland and Scotland before setting their rheumy sights on England. This allows Bartholomew the freedom to show the devastation that the undead would have caused to a mid-19th century economy and population, as well as create some frankly epic battles pitching entire battalions of red-coated British soldiers against the zombified populations of Ireland and Scotland. Given the rarity of finding titles in the zombie genre like Bartholomew’s, I was therefore incredibly happy to stumble across Blood, Mud and Corpses by C.M. 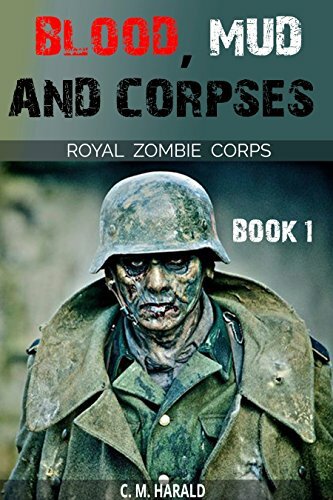 Harald, the first title in the Royal Zombie Corps series, set in the trenches, shell holes and blood-soaked barbed wire of the First World War. Following a group of conscripts in the British Army from their initial training, through to their journey to France and their first taste of action on the Western Front, Blood, Mud and Corpses is a deeply interesting tale for a number of reasons. Firstly, the afterword highlights that the author is a teacher with an interest in this period of history, and this passion for the era certainly shines through in the period detail; at every step, from training to trenches, the conscripts journey and experiences feel entirely genuine, and this does a great deal to enhance the story and draw the reader in. Secondly, the undead are not revealed until the last third of the book, meaning that Harald has plenty of time to create the tense and gut-churning atmosphere of serving in the trenches, deftly portraying the numerous different reactions that new conscripts (and returning veterans) would have experienced at the frontline, and particularly before ‘going over the top’ during assaults on the German trenches. Thirdly, when the undead are revealed, the author manages to avoid yet another cliché of the zombie wartime subgenre: that of the evil, megalomaniac German occultist scientists/team/department creating zombies in some sort of storm-wracked castle laboratory as a final weapon to be used against the Allies. They are instead introduced in what seems to be a deliberately understated manner; a few rumours as the conscripts head towards the front, and then the appearance of a solitary revenant in a shell-crater in a scene that does a superb job of actually making the reader emphasise with the wretched and lonely existence of the undead. By the end of the story, and after a well-written action scene, an intriguing world has been developed, one which is highly enticing and difficult to resist. Blood, Mud and Corpses is a relatively short title, which I managed to finish in just a few hours of fairly intense reading, and is the first book of an on-going series. There are a few issues with the title in regards to spelling and punctuation, and a light copy-edit would certainly be beneficial, but these are distinctly minor complaints. Blood, Mud and Corpses is a fantastic and highly readable story, and I look forward to reviewing the rest of the series in the near future on this blog. Thank you for the generous review on your blog and Amazon UK. I hope you enjoy the rest of the first series.